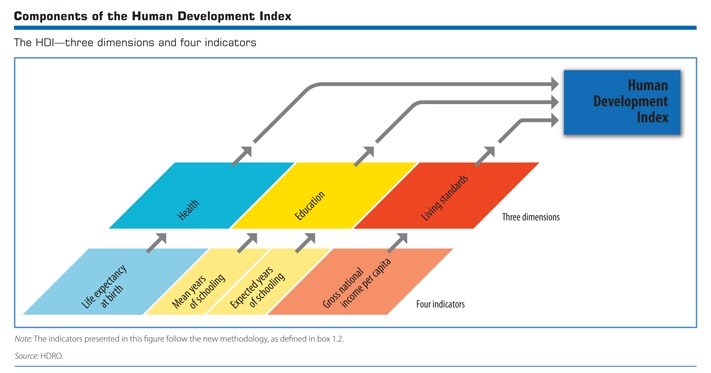 The Human Development Index (HDI) is a composite measure of health, education and income that was introduced by the United Nations Development Programme as an alternative to purely economic assessments of national progress, such as Gross Domestic Product (GDP). In the field of international development, the HDI soon became the most widely accepted and cited measure of its kind. 3. Enjoying a decent standard of living (income). • Expected Years of Schooling. From these, a number between 0 and 1 is produced – with 1 being the best possible HDI and 0 being the worst possible HDI. As of 2012, Norway ranked number 1 out of 187 countries with an HDI of 0.955. Drought stricken Niger and the conflict-torn Democratic Republic of the Congo tied for last place with an HDI of 0.304. Measuring Do Good Lab’s first three partners this year: Zambia ranks 163rd with 0.448, Kenya 145th with 0.519, and India 136th with 0.554. Do Good Lab’s main objective is to support projects that will directly enhance the quality of life for those in need. This is accomplished not simply from granting material goods, but from the measure of sustainable progress that is obtained when individuals use these resources for maximum potential and overall benefit of the community. Just one project can grant freer accessibility towards education, agricultural endeavors, and safe health practices. Development within these realms will improve HDI levels significantly for the thousands who struggle in hardship. We are happy to be a part of such a remarkable cause this year, and encourage you to join us in our journey. Posted by Aezed Raza on Friday, August 9th, 2013 at 3:21 pm and tagged education, Global Health, HDI, Health, Human Development Index, India, International Development, Kenya, nonprofit, People's Action in Development, Sustainability, UNDP, United Nations, Water, Zambia.